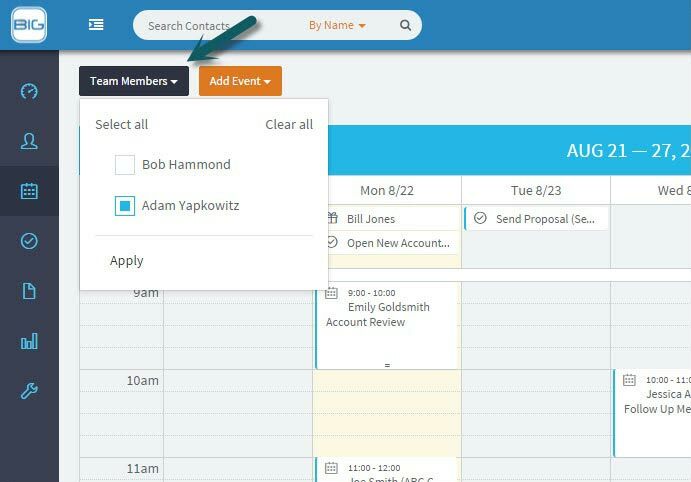 BIGContacts includes a full featured Team Calendar that makes it easy to track your meetings as well as the events for everyone on your team. 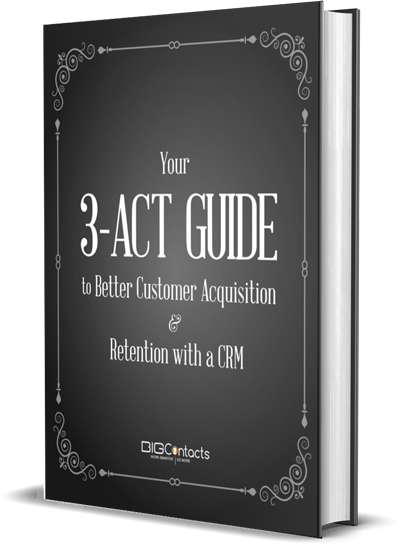 In addition, you can instantly synchronize meetings between BigContacts and Google or Outlook calendars. 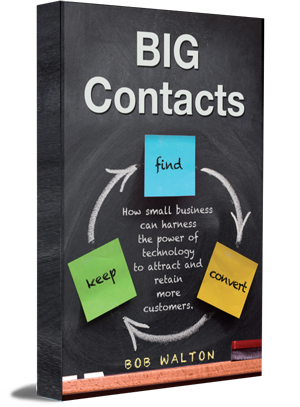 In addition, you can synchronize your Contacts, Tasks and Emails between Outlook and BIGContacts. No matter what view you are in (day, week, month) you can see everything you need to do that day… Including all Meetings, Tasks and ToDos all there on the calendar. From this view we make it very easy for you to reach out to this contact if you want. You can click directly on the name and go to the contact record so that you can review more about their relationship prior to contacting them to wish them a happy birthday. You can click on their work or home email and instantly open a window to send them an email with well wishes on their birthday. You can click directly on their work or home phone number to call them using Skype if you have Skype installed on your computer. 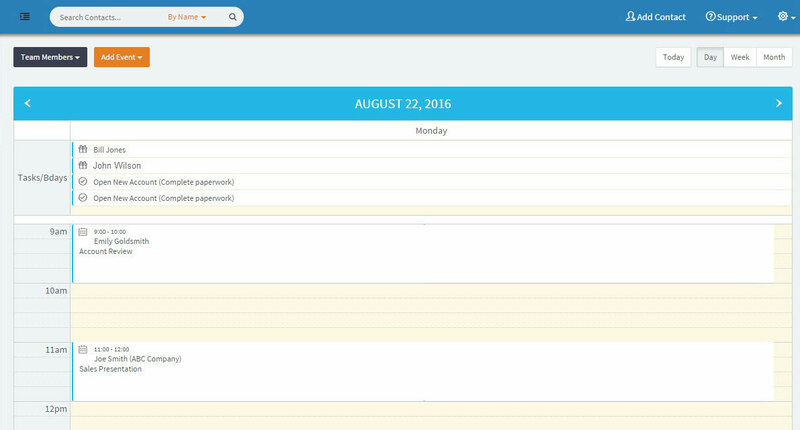 In the Day view, you will notice that the “Calendar” and your “Tasks and To-do’s” are organized into two separate folders. This is done to make it easier to work your list of tasks for that given day. You will also notice as many as four different icons to the left of a given meeting. You can hover over any one of these icons and they will give you information about the meeting and also allow you to edit the meeting as needed. You will notice that we prominently highlight the current day on your calendar. The current day on the week or month view is now highlighted with a very visible yellow highlight. At the top of the calendar view you will see your familiar “Pending Task” section. In here we give you account of the total tasks that you have for that day. Finally, you’ll see the “Birthdays” section where the list each of your contacts that are having a birthday that they along with a count of the total number of contacts that are having a birthday. You will notice that you can click directly on the age of the contact and it will take you to their contact record, allowing you to reach out to them as needed to wish them a happy birthday. From the Calendar tab you can easily select the view you want in the top blue bar. In the upper left-hand corner just above the blue header for the Calendar, you will see a field labeled “Team Members.” This function allows you to select the team members that you wish to view. 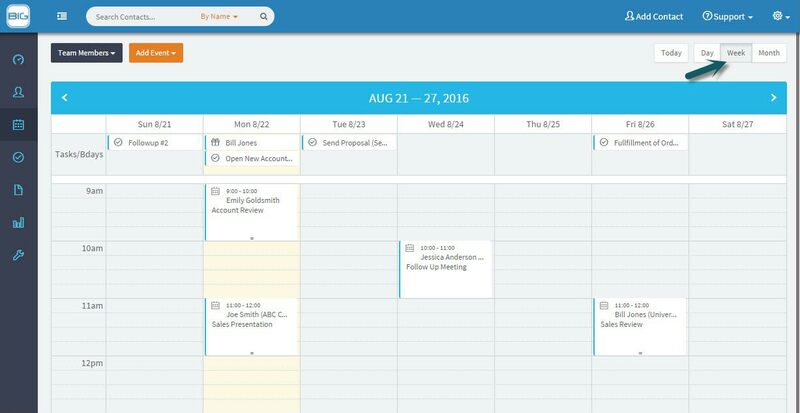 It also allows you to customize the view on your calendar and essentially layer in one team member at a time to see only the schedules you need. Now you can see your month at a glance. Each time we move out a layer on the calendar and zoom out to get a broader view of our schedule, we have now adjusted the level of detail and information that we display on the calendar. We also default the “Pending Tasks” and “Birthdays” folders to a closed position. This is where the number account really comes in handy. Since these folders are defaulted to a closed position you can see at a glance if you have any pending tasks or birthdays for that day without having to click to open a folder. When clicking on the Calendar tab many of our users want to have a way to tell the system what calendar view they prefer to go to by default. This has now been implemented for you! So, the next time you go to your calendar, you will find the three view options and simply click on the view that you prefer to see and our system will remember the last few that you selected and will display that view every time you login and go to this tab in your account. Small improvements like this add up to great convenience and significant time savings for our users. You now have the option to show birthdays on each of your calendar views. By default, your account will display a birthday section on each view of the calendar and you can change/remove this from your calendar by going to the “Admin” tab and then selecting the “customize account” option. 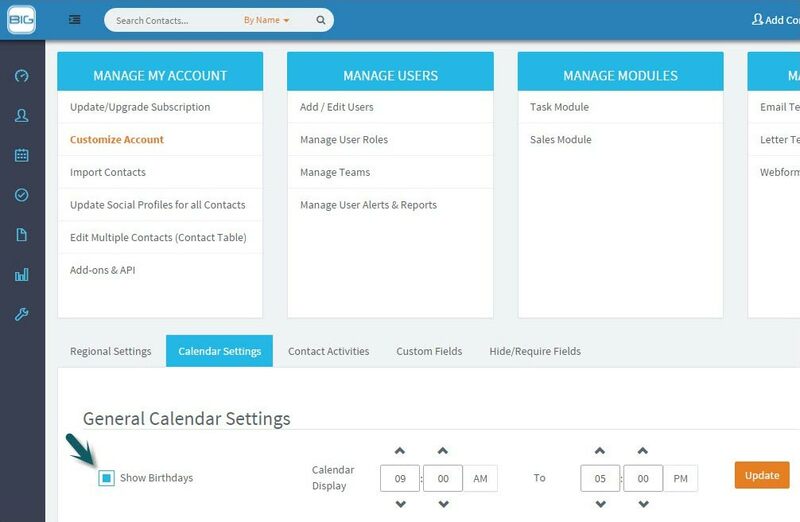 In here, you will then select the “calendar settings” option and you will see a radio buttons where you can choose to either show birthdays or hide them from view on your calendar. No matter what view you are in (day,week,month) you can see everything you need to do that day… Including all Meetings, Tasks and ToDos all there on the calendar.